Litigation: Cruise Ship Accessibility After 25 Years! Twenty years ago, accessible cruising was an impossibility. Notwithstanding that a cruise ship – a resort at sea – was the ideal vacation with everything at one’s fingertips — for a person with a disability it was just impossible. There were no accessible rooms, no accessible bathrooms, public rooms on different levels without any access. To get out onto the deck, into cabins, or into any bathrooms, most cruise ships had three inch high thresholds (called combings), and the rare times when ramps were available, the ramps were too steep for a person in a wheelchair. Certain types of wheelchairs were not allowed on ships, the blind were required to have “companions”, and the deaf did not get interpreters. Twenty years ago, the question was why. Why shouldn’t these vessels that serve the American public, and service United States ports be subject to the same United States laws. The question was not definitively answered until 2005 when the Supreme Court ruled in Spector v Norwegian Cruise Lines that vessels that serve US ports must comply with US law. However, Spector was not even on the horizon when I sued Carnival Corporation on behalf of Edward Resnick and Access Now in 1998. Edward Resnick was a pioneer in Disability Rights advocacy. During World War II, he served in the United States Navy. Following his military service, he graduated from the University of Florida with B.A. and J.D. degrees, both of which were received with highest honors. In 1954, Edward contracted polio and remained a quadriplegic and full time wheelchair user. In a world of barriers to persons with disabilities, Edward became known as the father of condominium law in the southeast. His successful law practice specialized in condominium, real estate and banking law until his retirement in 1982. When the Americans with Disabilities Act was passed in 1990, Ed, and his wife Phyllis, believed that this new mandate would change their lives and Ed would have access throughout Miami Beach and Dade County. It didn’t happen. No one seemed to notice. Ed and Phyllis wrote dozens and dozens of letters to local businesses and hotels and advised them of the new law, with the expectation that access would be provided. It didn’t happen. No one seemed to notice. Ed had enough. Ed and Phyllis founded Access Now. Ed waited enough and the time was NOW. So in the 1990’s Ed, and several other advocates decided that they were going to be ADA advocacy juggernauts, and that this new law provided them the tools that they needed to ensure that their communities would be accessible to them as well as all others in the community now, and in the future. So, in 1998, when, on behalf of an elderly couple from Massachusetts, I claimed that the man’s shoulder injury was due to a door on an elevator that did not have proper controls for persons with disabilities, Ed and Phyllis Resnick came to me and said, sue Carnival Cruise Lines and make them accessible. Ed said that it was not fair that he, or any other person who uses a wheelchair, should not have the opportunity to go on a cruise. At the time, the US Access Board, the governmental agency responsible for developing and maintaining accessibility guidelines for transportation vehicles, was still in the process of developing guidelines, but, in the tenet of Access Now, access was to be NOW and not later. Access Now sued Carnival Corporation, and the parties settled in a landmark settlement in 2002 which led to the push for accessibility in vessel design based on the alterations that can be easily made to passenger vessels. Since that time, the Access Board has developed guidelines for passenger vessels, and the Department of Transportation has issued regulations for how passengers are required to be given equal access to all programs and services of a cruise ship. But, discrimination still occurs. This month, DIG filed a lawsuit on behalf of Matthew Hendrick, who is a quadriplegic, who took a cruise on the Celebrity vessel Solstice from April 20 to May 1. Matt Hendrick has been involved in all types of activities such as being an avid cyclist, and was humiliated and degraded by not being permitted to have the same benefits of others who were on the cruise. At some ports, the vessel will anchor off shore, and guests are taken to shore by small boats called “tenders”. Even if the ship is scheduled to dock at a pier, it can change to tendering. If Matt could not board a tender, he could not go off of the vessel or do any of the excursions. After being told that he cannot get off the ship, Matt Hendrick immediately went to guest relations who set up a meeting for him to discuss the issue with a purser. The purser encouraged him to just try to get on the tender and see what happened. Matt went down to the disembarkation lounge where the Celebrity employee asked him if he could take a step. When Matt said “no”, the employee took him around to a lift, which lowered him level with the tender, where four crewmen held the wheelchair and put it on as easily as Matt had done on a prior cruise with another cruise line. The tender filled up and then security stopped it before it started moving, a uniformed officer came by the tender and demanded that Matt leave the tender. 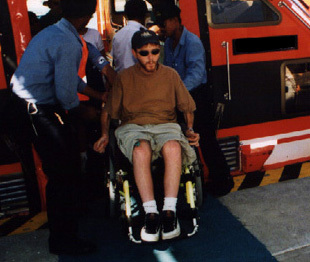 The uniform crew demanded that Matt take the brakes off his wheelchair, and the officer took control of Matt’s wheelchair and took him off the tender. Matthew Hendrick returned to his room and there was a message from the purser who encouraged him to go on the tender, saying how excited he was that Matt was able to get off the ship. Matt went down to guest relations again and talk to a purser who was the manager, she explained that Celebrity’s policy was that to go on the tenders, guests must be able to take steps on their own. She further explained that the policy was for Matt’s safety. Once Matt returned home to Colorado following the cruise, he spoke with the disability services person at Celebrity and was told that the policy of needing to take a step to get on the tender had been around for seventeen years. When I sued Carnival Cruise Lines in 1998, there were no regulations governing the actions of cruise ships, but since then, the US Department of Transportation provided guidance for cruise ship operators to follow the ADA. What are PVOs’ obligations for assisting passengers with a disability in getting on and off a passenger vessel? If a passenger with a disability can readily get on or off a passenger vessel without assistance, you are not required to provide such assistance to the passenger. You must not require such a passenger with a disability to accept assistance from you in getting on or off the vessel unless it is provided to all passengers as a matter of course. With respect to a passenger with a disability who is not able to get on or off a passenger vessel without assistance, you must promptly provide assistance that ensures that the passenger can get on or off the vessel. When you have to provide assistance to a passenger with a disability in getting on or off a passenger vessel, you may use any available means to which the passenger consents (e.g., lifts, ramps, boarding chairs, assistance by vessel personnel). Many similarly situated cruise lines do not have similar rules that prohibit the use of tenders by those who cannot independently take a step, including Carnival Cruise Lines, and some cruise lines have a specially designed lift system that provides seamless transfer from tender to shore, such as Holland-America Line. While the ADA was passed in 1990, and Edward passed away in 2003, the rolling thunder of Edward’s mantra of ACCESS NOW continues to reverberate in my head. Because of Edwards’ advocacy, Matt Hendrick can take a cruise. Because of Matt Hendrick’s advocacy, persons with disabilities in the future will be able to come back to shore.